Here in New York, fall doesn’t begin until this afternoon at 4:02 PM, so I got in what will probably be this year’s first and last review of a saison – a classic and refreshing Belgian beer style generally favored for summer drinking – just under the wire. Which isn’t to say that this week’s eccentric beer – Le Capitaine by Trinity Brewing – is a particularly characteristic example of a saison anyway. Once an obscure, rustic product hard to find outside of its Wallonian homeland, saisons are now familiar to drinkers around the world, who know them as refreshing, zesty ales loaded with spicy and fruity flavors produced by distinctive farmhouse yeast strains that saison brewers have cultivated for generations. The style has been adopted enthusiastically by contemporary craft brewers, so there are a lot of creative variations out there on the delicious but austere originals. Bearing that in mind, to say that the brewers at Trinity have taken liberties with this style would be an understatement: labeled as a “Golden Saison Regal,” Le Capitaine is a whopping kitchen sink of a beer, brewed with an “absurd amount” of pumpkin, candied endive, cacao nibs, Buddha’s hand (a bizarrely hand-shaped, perfumed citrus fruit from East Asia), fermented with an assortment of cultivated and wild yeast strains that give it a slightly sour streak, and then aged in oak Chardonnay barrels. Quite a departure from what originated as a simple farmhouse brew offered to Flemish field-hands during the summer harvest as a refreshing thirst quencher. Did I mention this beer clocks in at 10.4% alcohol by volume? Saison or not, I’m not sure I’d be up for harvesting endive, hops, chocolate, waffles, or any other Belgian crop after putting away a bottle of this stuff. It’s a wonder this review even got written. 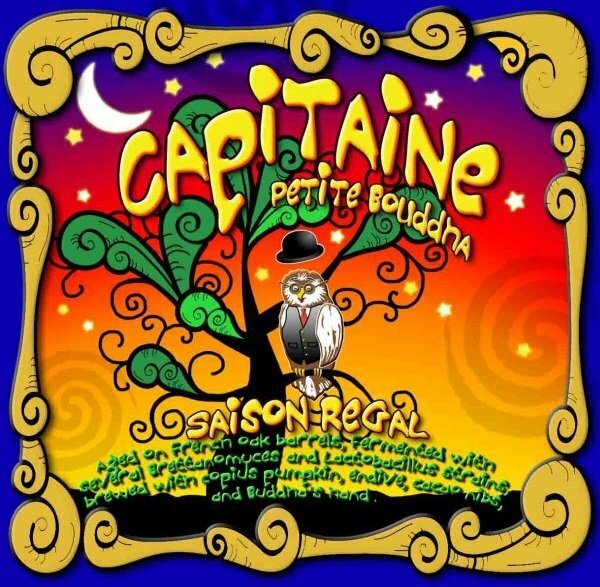 I’m not sure who or what Le Capitaine is, but the beer label features a dapper cartoon owl wearing round, wireframe spectacles, a vest and red necktie, with a black bowler – or derby – hat levitating over its head. I don’t know of any other association with birds beyond the label, so I’m inclined just to move on to the tasting notes because there’s a lot to cover in this one. But before that, I should mention that Trinity Brewing is a brewpub in Colorado Springs doing some admirable work: their pub was constructed entirely from recycled and repurposed materials, and they source local and organic ingredients as much as possible to reduce their carbon impact. Even the brewery’s spent grains, once shoveled out of the mash tun, are hauled off to a local farm as livestock feed. 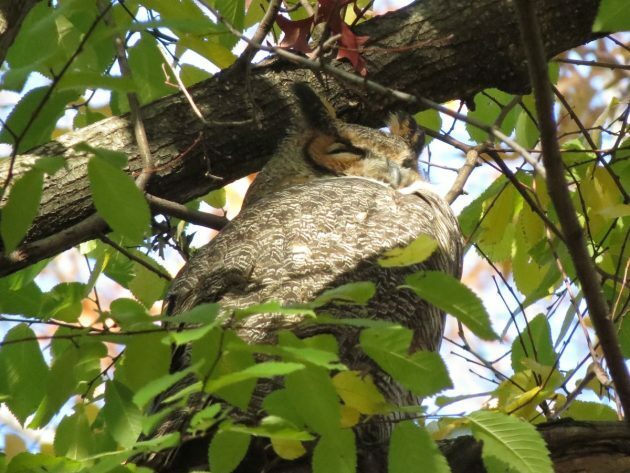 A Great Horned Owl, the most expected owl species in Colorado Springs according to eBird. Could this be Le Capitaine? Le Capitaine is a fizzy, luminously orange ale, but its effervescent head of tight, foamy bubbles dissipates rapidly (a common feature of sour beers). The nose offers a dizzying mix of heady fragrances: vinous and mildly acetic at first, before giving way to a blast of tropical fruits and herbaceous citrus notes, followed by musty wild yeast aromas that recall damp hay and washed-rind cheese (in a good way). A strangely agreeable vegetal aroma that could just as easily derive from pumpkin, endive, or hops – or all three – contributes an earthy background. There’s a lot going on here and one could spend all day picking out layers of flavors. I found the cacao nibs the least obvious aroma, but it’s there, providing an intriguing accent that works surprisingly well in this unlikely jumble of ingredients, adding depth much in the same way chocolate contributes to a mole Poblano. I was relieved to find the oaking restrained, but Le Capitaine certainly benefits from its time in the barrel, adding tasteful, woody notes that reinforce its resemblance to wine. The beer’s flavor is dominated by those tropical fruit notes most often associated with classic saison fermentations – mostly expressed as pineapple here – with grape, lemongrass, and stone fruit flavors lining up in a supporting role, all sweetened slightly by the merest hint of caramel malt. The pumpkin essence again comes through as a faintly savory and welcome counterpoint – and by pumpkin, I mean the real, honest-to-goodness cucurbitaceous flavor of roasted squash, not the dreaded seasonal assault on one’s olfactory senses typically perpetrated by that ungodly blend of holiday baking spices (end rant). 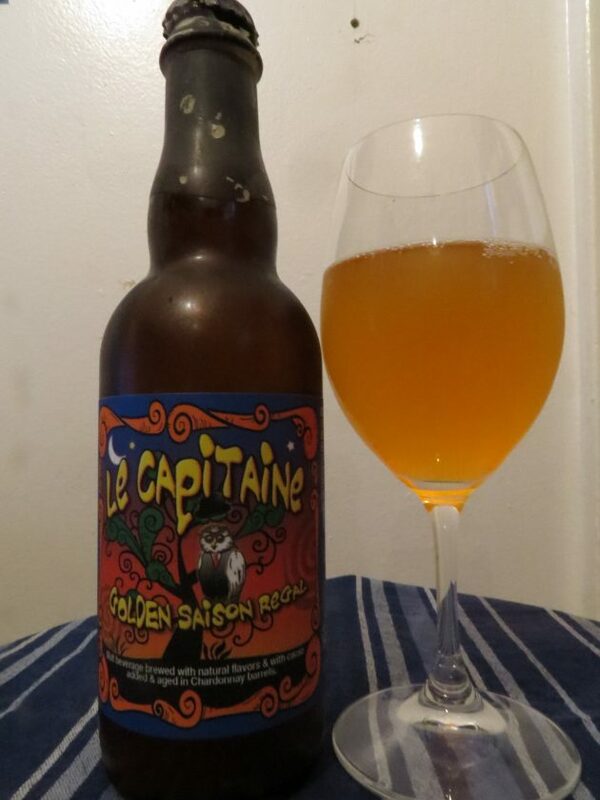 Le Capitaine is light-bodied and piquantly sour, but not overwhelmingly acidic, and drinks much more smoothly than its double-digit alcohol percentage would suggest. The pumpkin flavor lingers through its off-dry finish, before ending with a slight vinaceous tang. Le Capitaine is a complex, challenging beer easily enjoyed on its own, but it could work well as a pairing for a bright, citrus-dressed salad, or flavorful shellfish dishes, like moules marinières . Sour beers are often suggested as a match for smelly, washed-rind cheeses, but I also wonder how Le Capitaine would pair with a well-aged Parmigiano-Reggiano, the best examples of which often feature distinct pineapple notes. I would gladly drink this with a tropical fruit dessert – perhaps a passionfruit cheesecake – and it’d make a rewarding pairing for an appropriately rich and complex pumpkin pie. With all this talk of pumpkins, I think it’s time to admit that I’ve accidentally written a pumpkin beer review. Perhaps this saison makes a better autumn beer than I initially suspected. I’ll let the drinker decide if it’s a better fit for summer or fall – or maybe that simply depends on which side of today’s equinox you’re drinking. This is short notice, but tomorrow – September 23rd – in Queens, New York, the Voelker Orth Museum presents “Oktoberfest Flushing-Style: Sauerkraut and Kimchi,” a cross-cultural mix of fermented cabbage which will benefit the museum, its bird sanctuary, and Victorian garden. The Ogden Nature Center of Ogden, Utah will feature its second annual Birds & Brews event on September 29th. Beverages will be provided by Talisman Brewing Company, Roosters Brewing, and New World Distillery. Atlanta, Georgia’s Red Brick Brewing Company has teamed up with the Georgia Aquarium to release a series of seasonal beers, with a portion of sales to be donated to conservation and research efforts. The next limited edition beer in the series is Penguin Pale Ale, which will be launched at a public event at the brewery on September 29th. And finally, the Tennessee Brew Works has brewed a State Park Blonde Ale to benefit the Tennessee State Park Conservancy. Thanks, Patrick! That’s quite a collection; I’m going to have to look for some of those to review for the blog.